 Estimates given for every job!  Minimum fee of $35 (non refundable) includes a detailed equipment examination for an estimate and will be applied towards the total of the work order.  I work on: ProAudio Equipment / Recording Equipment / Vintage Hi-Fi and Hi-End Equipment, Vintage Guitar Amplifiers + Effects / Electronic Musical Instruments (Synthesizers / Vintage Keyboards and Organs) / on Hi-End Audio / On All Vacuum Tube Equipment and Other Quality or Esoteric Audio Related Equipment. 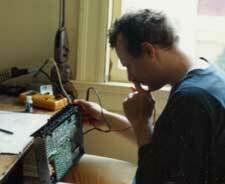 Here I was working on the modification of a digital delay unit in in my shop in San Francisco in the Cole Valley Neighborhood (1988-1993). This photo was taken 1992. At the time I reapaired and reconditioned Pro Audio, Hi-Fi and analogue synthesizers. My early electronic light scuplture cosmovision was conceived and designed here in 1993. In 1993 I began to work full time as an electronics tech for L&M Electronics, Daly City. Besides PRO-Audio I serviced also quality Home Audio equipment and performed factory authorized warranty service on brands such as: Acoustic Research, Bang and Olufsen, NAD, BOSE and many more. 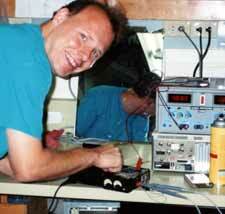 Within a year or so I specialized in PRO-Audio though and became L&M Electronics PRO-Audio Repair Specialist. Factory Authorized warranty on TASCAM equipment for example service was a daily routine. I earned my service specialist service certificate from Yamaha while working at L&M. In summer 1995 I chose to leave L&M to work for the California Academy of Sciences in the electronics department, my goal to expand my skillset further into electronics engineering, and computer technolgy, and focussed later on in multi media engineering. The photo to the right was taken in 1997 at the Academy, when I was calibrating a SONY TC-D5M portable tape deck (today I no longer service this model). Being known for my quality work I also serviced the science departments NAGRA and OTARI open reel decks. In spring 2000 I left the California Academy of Sciences to start my own business ULTRA ELECTRONIC ACTIVE and web site in 2001.